(Taipei, by BFJ): Executive Committee members of BFA were invited to watch Bronze Medal (Japan 8-2 Venezuela) and Gold Medal (USA 8-1 Chinese Taipei) games of IBAF 18U World Cup on Sunday, July 28 afternoon with a 10,000+ sell-out crowd at Tianmu Stadium in Taipei City, and to attend the closing ceremony. On Monday, July 29, the first EC meeting chaired by President Tom Peng (Chinese Taipei) was held and the discussions were focused on development of baseball in the region, particularly China and West Asia. Plans of training camps, seminars and umpire schools were introduced and Olympic reinstatement campaign strategy in Asia was discussed in detail. 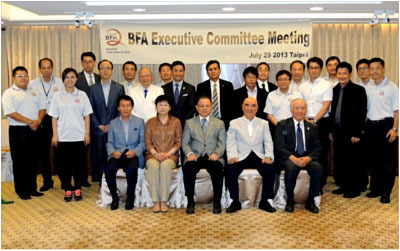 Demonstration of new BFA website (http://www.baseballasia.org/) received strong interest from EC members and the newly recruited BFA secretariat, Howard Tsai - Director of International Affairs, Ms. Aki Huang -Assistant Director, Administration Department and George Yeh - Assistant Director, Game Department were warmly welcomed by EC. In addition to EC members and their staff, the representatives of Nippon Professional Baseball and MIZUNO were invited to attend the meeting. Ken Maezawa, Deputy Special Council, Samurai Japan Business Strategy of NPB, explained the outline of their marketing scheme and expressed desire to work closely with BFA. All the EC members from China, Hong Kong, Korea, Japan, Philippines, Thailand and Chinese Taipei, plus Kazuhiro Tawa - Senior Adviser and Seid Khawar Sha - West Asia Development Executive Director joined the meeting.